This one-hour workshop is the perfect way to introduce your child to ponies. 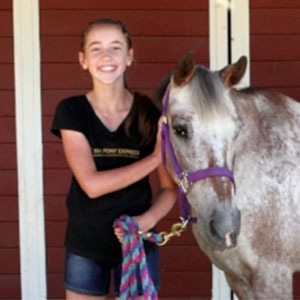 Participants, through hands on experience, will learn how to groom and saddle their pony and get an introduction to basic riding skills including balance, walking and trotting. Please Note: All participants in horsemanship classes must bring and wear a properly fitting helmet (either a bike helmet or a USEF approved riding helmet), closed toed shoes (preferably with a heel) and pants. There is also a maximum weight limit of 100 lbs for participants.